How common is head lice infestation? How in the world does a child get head lice? Does getting an infection with head lice mean that the person has poor hygiene? What do head lice look like? 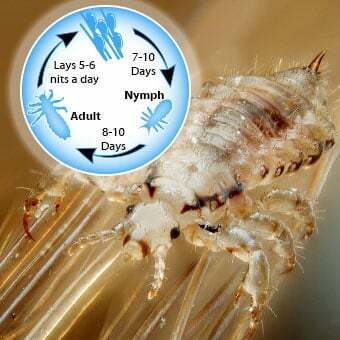 What is the life cycle of head lice? Does a black light help to diagnose lice infections? What is the treatment for a head lice infestation (pediculosis)? What prescription drugs treat head lice? What are the rules with head lice medicines? Is it possible to prevent head lice? Should household sprays be used to kill adult lice? What is the prognosis of a head lice infestation? Should schools and day cares refuse children until no nits are present? Is reinfestation with head lice common? Head lice spread from person to person by head-to-head contact through direct contact with the hair of an infested person. Although less common, head lice can spread by personal contact or the sharing of combs, brushes, caps, and other clothing. Head lice are a common problem with preschool and elementary school-aged children. Very young children should be evaluated by a health care professional before beginning medications. Head lice (Pediculus humanus capitis) are parasites that can be found on the heads of people. Pediculosis is the term for an infection with head lice. (The head louse, Pediculus humanus capitis, is different from the pubic louse (Pthirus pubis), which causes pubic hair infections, and the body louse (Pediculus humanus corporis). Head lice infestation is very common, and it has been around since ancient times. While the exact frequency of infections is unknown, estimates range from 6-12 million cases annually. Anyone who comes in close contact with someone who already has head lice, or even their contaminated clothing and other belongings, is at risk for acquiring head lice. So it is easy to transmit head lice from one person to another. Preschool and elementary-school children (3-11 years of age) and their families are infected most often. Girls contract head lice more often than boys, and women contract more head lice than men. A child can contract head lice in a number of ways. No. Getting a head lice infection has nothing to do with personal hygiene. Anyone can become infested with head lice. There are three forms of lice, namely the nit, the nymph, and the adult louse. Nit: Nits are lice eggs. Nits are hard to see and are often confused with dandruff or hair-spray droplets. Nits are found firmly attached to the hair shaft. They are oval shaped, 2-3 mm in length and usually yellow to white in color. Nits take about a week to hatch. Nymph: The nit hatches into a baby louse called a nymph. It looks like an adult head louse but is smaller. Nymphs mature into adults about seven days after hatching. To live, the nymph must feed on human blood. Adult: The adult louse is about the size of a sesame seed, has six legs, and is tan to grayish-white in color. In people with dark hair, the adult louse looks darker. Females lay nits; they are usually larger than males. Adult lice can live up to 30 days on a person's head. To live, adult lice need to feed on human blood. If the louse falls off a person, it dies within two days. Life cycle: The nits hatch into nymphs, which become full grown lice. In order to produce more nits, the adult lice must mate. Head lice are most frequently located on the scalp behind the ears and near the neckline at the back of the neck. Head lice hold on to hair with hook-like claws that are found at the end of each of their six legs. Head lice are rarely found on the body, eyelashes, or eyebrows. Head lice are often confused with dandruff. Dandruff can easily be distinguished by combing the hair or even just rubbing. Dandruff should be easily removed, but the nits of head lice are firmly attached to the hair shaft. 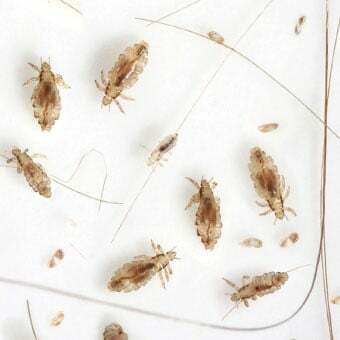 Head lice can be detected by looking closely through the hair and scalp for nits, nymphs, or adults. Locating a nymph or adult may be difficult; there are usually only a few of them, and they can move quickly from searching fingers. However, the presence of nits close to the scalp confirms that a person is infested. If the nits are located more than ¼ inch from the scalp, the infestation is probably an old one. If you are not sure whether or not a person has head lice, the diagnosis should be made by a health care professional, school nurse, or a professional from the local health department or agricultural extension service. The nits of head lice are easily visible with a microscope. Dr. Ioffe-Uspensky performed a study that showed that using a louse comb was better than visual inspection alone when screening for lice infestations. A black light is sometimes used to see if there are nits with live lice in them. Some reports indicate that nits with live lice will fluoresce. For effective elimination of head lice, the infested individual, family members that are also infested, and the home must all be treated. It is important to remember that treatment should only be started if there are clearly live lice identified. According to the American Academy of Pediatrics in a recent clinical report, "The ideal treatment of lice should be safe, free of toxic chemicals, readily available without a prescription, easy to use, effective and inexpensive." Apply lice-killing medicine, also called pediculicide, according to the label instructions. If a child has extra-long hair, one may need to use a second bottle. Warning: Do not use a cream rinse or combination shampoo/conditioner before using lice medicine. Do not rewash hair for one to two days after treatment. If some live lice are still found eight to 12 hours after treatment but are moving more slowly than before, do not retreat. 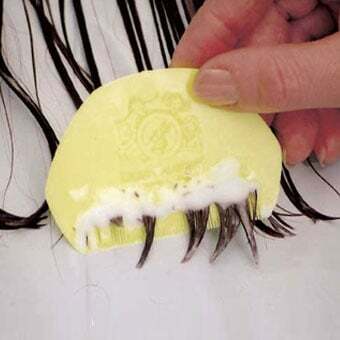 Comb dead and remaining live lice out of the hair using a fine-toothed comb (lice comb). The medicine sometimes takes longer to kill the lice. If no dead lice are found and lice seem as active as before eight to 12 hours after treatment, the medicine may not be working. 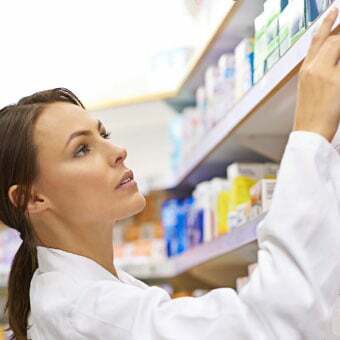 See a health care professional for a different medication and follow their treatment instructions. Nit (head lice egg) combs, often found in lice medicine packages, should be used to remove nits and lice from the hair shaft. Many flea combs made for cats and dogs are also effective. After the initial treatment, check, comb, and remove nits and lice from hair every two to three days. Retreat in seven to 10 days. 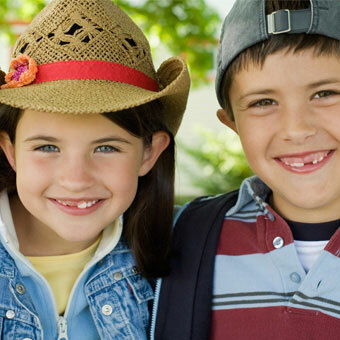 Check all treated people for two to three weeks until you are sure all lice and nits are gone. Machine wash all washable clothing and bed linens that the infested person touched during the two days before treatment (to kill the lice and nits). Use the hot water cycle (130 F; 55 C) to wash clothes. Dry laundry using the hot cycle for at least 20 minutes. Soak combs and brushes for one hour in rubbing alcohol, Lysol, or wash with soap and hot (130 F; 55 C) water and then place in bag and leave in freezer for two days. No. Although anyone living with an infested person can get head lice, you don't need to be treated. Check household contacts for lice and nits every two to three days. Treat if lice and nits are found. For children under 2 years old, remove nits, nymphs (immature adult lice), and adult lice by hand, and see a health care professional. Permethrins are approved for children older than 2 months of age; however, this should too be done after consultation with your physician. Pyrethrins (often combined with piperonyl butoxide, in brand name products: A-200, Pronto, R&C, RID, Triple X): Pyrethrins are natural extracts from the chrysanthemum flower. Though safe and effective, pyrethrins are not ovicidal (egg-killing) and can only kill crawling lice, not unhatched nits. It is applied to dry hair and allowed to remain for 10 minutes but no longer. After 10 minutes, the hair should be brought to a lather with warm water and then rinsed clear. Finally, towel dry (no hair dryer). A second treatment is recommended in seven to 10 days to kill any newly hatched lice. Treatment failures are common due to, in part, the development of resistance. They should not be used in people allergic to chrysanthemum or ragweed. Pyrethrins are approved for use on individuals 2 years of age or older. Permethrins 1% (NIX): Permethrins are similar to natural pyrethrins. Permethrins were introduced in 1986 and are safe and effective and may continue to kill newly hatched eggs for several days after treatment. The person should first wash their hair using a shampoo without a conditioner and towel dry the hair until it is still damp but not soaking wet. Apply the NIX to the damp hair and scalp. Make sure to get behind the ears and neck. Leave NIX in hair for 10 minutes but no longer. Rinse hair completely and towel dry. A second treatment may be needed in seven to 10 days to kill any newly hatched lice. Treatment failures are common, but NIX can be used on children as young as 2 months of age. Dimethicones (LiceMD, silicone oils, Hedrin, NYDA): Dimethicones are a type of silicone oil. These products are believed to work by coating surfaces and acting as a physical barrier that asphyxiates the louse. Unfortunately, there has been very limited research on their effectiveness. Nevertheless, some limited studies have shown moderately good rates of killing the lice. These dimethicones are biologically inert and are considered non-toxic in humans. In the United Kingdom, they are used almost exclusively, and they are considered highly effective by many physicians. Other agents: There are a number of other agents that have been used to treat lice. Some agents mix coconut oil and tea tree oil with permethrins or pyrethrins. It is not clear if these agents work alone or only in combination with other pediculocides. Other home remedies include using olive oil, mayonnaise, and even vinegar. However, there are no studies proving their efficacy. Malathion .5% (Ovide): Malathion is an organophosphate insecticide that is only available as a prescription and it kills live lice (pediculicidal) and the lice inside the eggs/nits (ovicidal). It has actually been pulled off the market twice due to safety concerns, but it was reintroduced in the United States (USA) in 1999 due to increasing resistance of head lice to other treatments. The formulation in the United States contains terpineol dipentene, isopropyl alcohol, and pine needle oil, both of which have pediculicidal properties. The product is used differently than other compounds. The product is extremely flammable and should never be around heat, hair dryers, or curling irons. The product is applied to dry hair until the scalp and hair are thoroughly coated. Make sure that the area behind the ears and the back of the neck are covered. Let the hair dry naturally (no hair dryers). The product is left in place for eight to 12 hours. After eight to 12 hours, wash and rinse the hair with shampoo. Use a nit comb (fine-toothed comb) to remove any nits. If live lice are noted after seven days, retreat. It is currently recommended only for individuals 6 years of age up to 60 years of age. Benzyl alcohol 5% (Ulesfia): Benzyl alcohol is available in the U.S. as a 5% lotion. The product is applied to dry hair until the scalp and hair are thoroughly coated. Make sure that the area behind the ears and the back of the neck are covered. Leave it in the hair for only 10 minutes and then rinse thoroughly in a sink. Do not use a shower to avoid getting the solution over the rest of the body. You can immediately wash your hair with regular shampoo. It is not ovicidal and needs to be repeated in one week if there is any evidence of live lice. Spinosad (Natroba): Spinosad is a derived from soil bacteria. It is both pediculicidal (kills the live lice) and ovicidal (kills the lice inside the eggs/nits). It is moderately more effective than the over-the-counter treatments but is available only by prescription and is very expensive. If live lice are noted after seven days, retreat. It is approved in children 6 months of age and older and contains benzyl alcohol, as well. 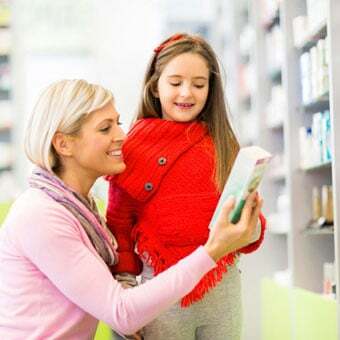 Ivermectin (Sklice): Ivermectin is available as both a 0.5% lotion (which is FDA approved for the treatment of lice) and as an oral medication (which is not approved in the U.S. for treatment of lice). It has been used to treat helminthic infestations (worms) for many years. Generally, only one treatment is needed. It is pediculocidal (kills live lice). Although it is not ovicidal (kills the lice inside the eggs/nits), it appears to prevent nymphs (newly hatched lice) from surviving. Topical ivermectin lotion may be used in the treatment of lice in children 6 months of age and older. While oral invermectin is commonly used in other countries for lice, it is currently not approved for the treatment of head lice in the U.S. In countries where it is approved, the dosage is usually a single dose, which is often repeated in nine days. Lindane (Kwell): It is important to note that lindane 1% (Kwell) is no longer recommended as a treatment option for head lice due to its toxicity in children. It can still be prescribed, but most experts recommend against its usage. 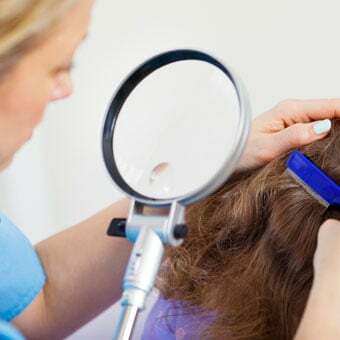 Other treatments such as permethrin 5%, crotamiton 10%, and sulfamethoxazole-trimethoprim (Bactrim) are not currently approved by the FDA for the use in the treatment of head lice. Occlusion therapy, nit combing, and hair removal have not been proven to be fully effective in completely eradicating head lice. Home remedies that have been tried include vinegar, mayonnaise, petroleum jelly, olive oil, butter, rubbing alcohol, and prolonged water submersion. These all fail to eliminate infestation, because these therapies do not kill all of the eggs or lice. This is believed due to the specialized way the parasite "breathes." Hair removal has never been proven to be effective, but since the louse requires a hair shaft to lay its eggs, it should prevent the lice from multiplying. This is not always considered a desirable option for many children. There is also a device that uses hot air to kill the lice. The device, OneCure, is an FDA-cleared home device. Currently, there are no published studies looking at the efficacy of this product. If unsure, please consult with a pharmacist or health care professional. When using head lice medicine, as with any medicine, always follow the instructions provided. do not mix different head lice medications. It's not always so easy to prevent head lice 100% of the time since it is a common infestation. Whenever possible, do not share hats or head coverings. Also avoid sharing combs and brushes with other individuals, since it can be transferred this way. If exposed to another individual diagnosed with head lice, continue to check the hair for eggs or adult lice every couple of days, but do not treat unless head lice are discovered. No. Spraying the house is not recommended. Fumigants and room sprays can be toxic if inhaled. No. 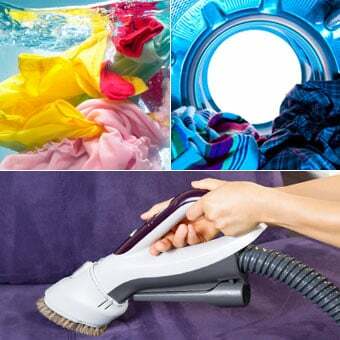 Vacuuming floors and furniture is sufficient to treat the house. Once diagnosed and treated effectively, the prognosis is excellent. Eradication is of course the goal, and occasionally retreatment and alternative treatments are needed. Always consult a health care professional if one needs advice. 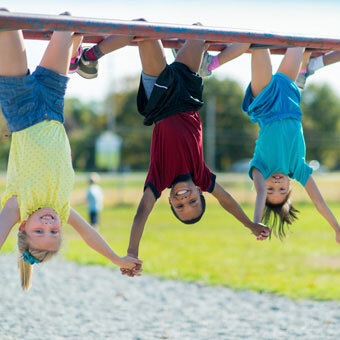 The American Academy of Pediatrics no longer recommends the so-called "no nit" policy of some schools and day cares. There is a very low risk of spreading lice within the classroom, and nits may not actually represent the continued presence of live lice. Although a child could get a new infestation from being reexposed to an infested individual, self-reinfestation is the most common way for the infestation to recur. 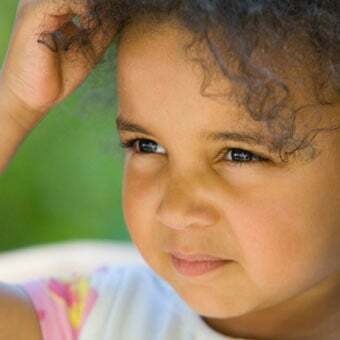 The CDC recommends checking the individual for two to three weeks to ensure that there are no new nits or lice. American Academy of Pediatrics. "Pediculosis Capitis (Head Lice)." Red Book, 30th ed. Elk Grove Village, IL: American Academy of Pediatrics; 2015. Chosidow, O. "Oral Ivermectin Versus Malathion Lotion for Difficult-to-Treat Head Lice." New England Journal of Medicine 362 Mar. 2010: 896-905. Devore, C.D., G. Schutze, J. Okamoto, M. Allison, R. Ancona, E. Attisha, and M. Minier. "Head lice." Pediatrics 135.5 (2015): e1355-e1365. Feldmeier, H. "Treatment of pediculosis capitis: a critical appraisal of the current literature." American Journal of Clinical Dermatology 15.5 (2014): 401-412. United States. Centers for Disease Control and Prevention. "Head Lice." Sept. 24, 2013. <https://www.cdc.gov/parasites/lice/head/index.html>.